Vacuum bagging makes a better layup but I'm too old to learn new tricks. In one month from tomorrow I'll be 70. And I'm a prototype maker anyway. I don't have the patience for fussy finish work and endless polishing. Hand layups work just fine. 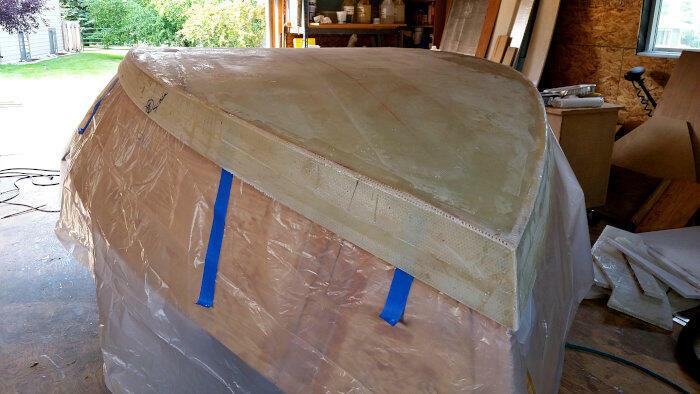 Last year I repaired the chine on a ten year old Plascore bottomed boat (with plywood sides) and it was a snap. 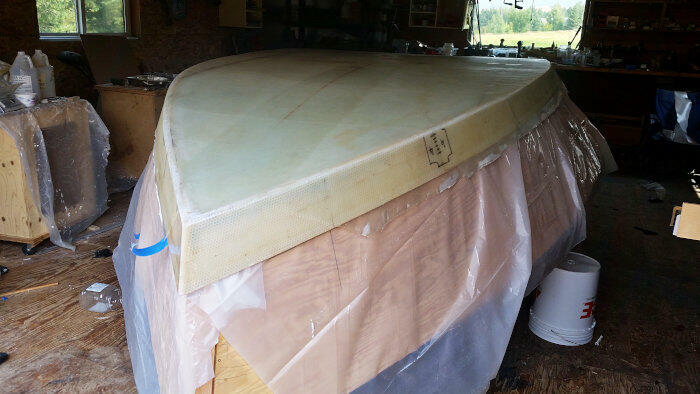 If I had used vacuum bagging 11 years ago that boat would have been ever so slightly lighter and a tad stronger. But what I made was plenty strong enough. The following is not really related to the transom photo above. But it's an interesting subject. Highly-polished automotive-like fiberglass takes forever to finish. And it accomplishes nothing outside the eyeball context. Have you ever done drywall finishing? Do you know how to make a knock-down drywall texture? It's oh oh oh so easy compared to smooth. And it looks just fine. Better to some eyes. And it sure is fast. The same applies to glass. The only place glass needs to be smooth is on the bottom, where the rubber meets the water. 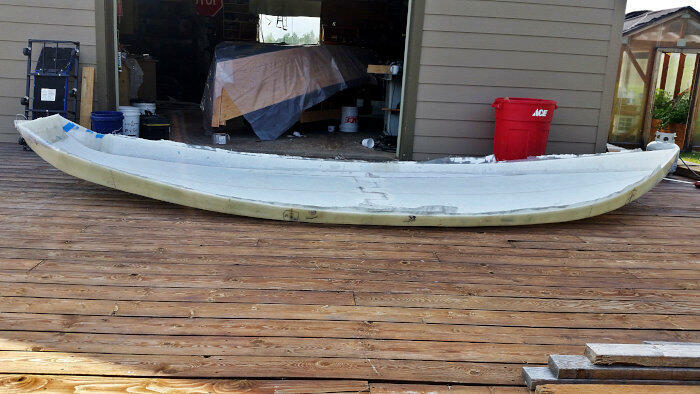 To the extent I use fiberglass at all I'm going with a knock-down texture from here on out. 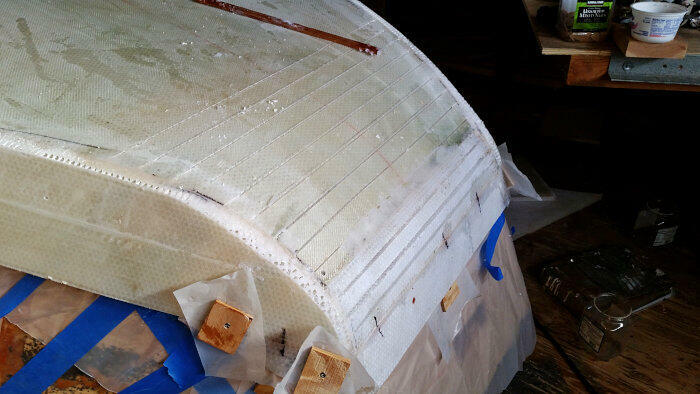 Almost but not quite smooth fiberglass looks like a skin disease. There isn't much middle ground. Either you make a knock down texture finish or you putty sand and polish for days or even weeks. Anything in between just looks bad. I'll smooth sand the edges tomorrow morning and then glass up the outside, using diagonal rows of 38" inch wide 6oz glass. Pop the bottom shoe off the mold and then glass the inside (of the shoe-like bottom piece). And then put that back on the mold. And then shim the sides of the mold a bit, so it's flush with the Plascore chine area and then bolt on the 3/8" inch Meranti Hydrotech finish side panels. And 3/4" inch transom. After that it will be all details details details. This will be a decked white water boat. I'm thinking I'll make the deck in 3 removable, bolt down onto a gasket pieces. I personally will never go anywhere with more than 2 passengers but I'd like to be able to bolt down different deck pieces as needed, so any other seating arrangement could be accommodated. I've had hardware for a sliding, rowing-scull-like rower's seat for ten years now. I plan to finally use it on this boat. When trouble comes you want to be able to row with your back and legs as well as your arms. I haven't seen a sliding rower's seat on a dory yet. Somebody must have done it but I haven't seen it. Glassed up the bottom today. 3 layers 6oz from Raka. I bought a whole role of a 38" inch discontinued fabric for half price. I ran one layer end to end with 3 lengthwise strips. Then two more layers by going side-to-side so each row overlapped the previous strip at mid strip. That's a skimpy, absolute minimum layup for the outside but I'll run with it. I can always add more glass. I'll be off fishing all of next week. Will I get the inside of this bottom shoe glassed up this weekend? We'll see. Small note on the above. The shoe didn't want to lay flat on the mold after I draped visqueen over the mold first--below the bottom shoe. So I pushed it down and added a few strategically-placed screws. Then I pushed small bits of bar soap into the Torx screw heads, marked them with a Sharpie pen and glassed over top. I'll dig those screws out today. The bar soap is critical. I've done it before. It works.